Clickable Map of Africa, showing the countries, capitals and main cities. Map of the world's second-largest and second-most-populous continent, located on the African continental plate. The "Black Continent" is divided roughly in two by the equator and surrounded by sea except where the Isthmus of Suez joins it to Asia. In north Africa is bounded by the Mediterranean Sea and the Strait of Gibraltar, in west by the Atlantic Ocean, in south and south east by the Indian Ocean, and on its north eastern coast by the Red Sea, and the Gulf of Aden. 54 sovereign states ("countries"), and a handful (10) of small dependent territories, still controlled by former colonial powers. All African states except Morocco are members of the African Union, the association of sovereign African nations established in 2001 in Addis Ababa, Ethiopia. Click on the country/city name on the map to get more information about each African Nation, or major city, or you may also use the links below. 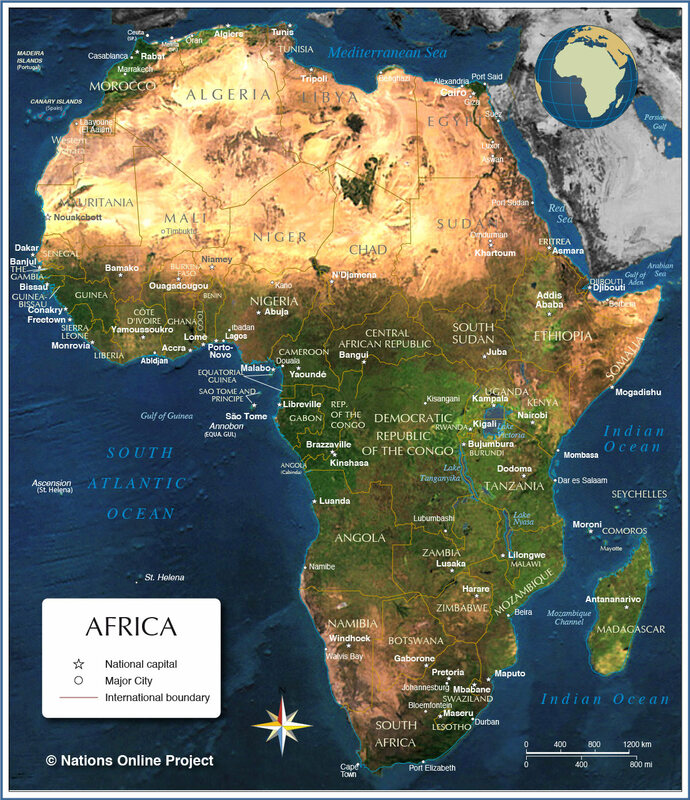 Maps of African countries can be found below or on the respective country page. Map of the African continent with countries, main cities and capitals.